It was a productive time in the last 10 days, as I worked though the backlog of donation quilts I promised to do. Having the longarm down for three weeks didn’t help. Most of this is my own making, as I wanted to do several small quilts for the club’s donation to Mainstay and Open Arms, both local charities. I did another of the four patch quilt, and got it on the frame. 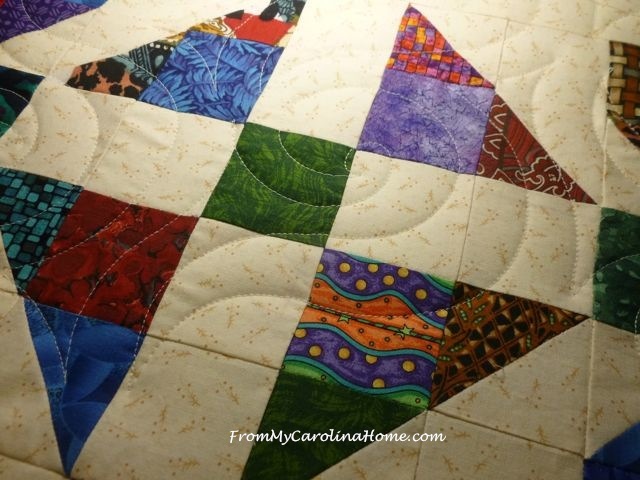 I still had the Wrought Iron pantograph loaded up, and thought it would do fine for this little quilt. I like the way it overlaps the previous row. Thread was a variegated green Superior with Bottom Line in the bobbin. Warm and Natural batting. Sunday’s are made for hand sewing binding while watching football games. Then, I was asked to quilt a top for a fellow club member, Betty, who has had some health problems. 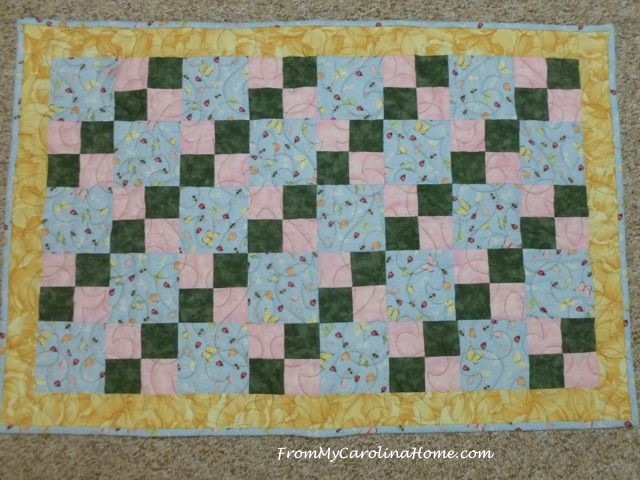 Another member took her blocks and sewed them together with borders. She brought it to me, last week and I was thrilled to see it was Scrap Dance, the original! I love the colors she used. There is a lot more blue than I generally like, but it really works here. I decided to put a swirl pantograph pattern on it to soften the sharper angles. I did the quilting in a lighter ecru color thread, so the texture shows on the light borders. Thread is Essentials on the top, and Bottom Line in the bobbin. Batting was donated to us by the Warm Company, Warm and White. A few minor puckers on the borders were pretty well flattened with some steam and judicious pressing. Overall the quilt looks wonderful. Club member Sharon picked it up to bind it, and it will go to a local charity. I didn’t have the heart to tell her about the mistake in the bottom row. Do you like this pattern? It is for sale in my Craftsy store, click HERE. Shame about the mistake on the bottom row but it still looks a wonderful work. The colours are great. Yes it is, but I didn’t have the heart to tell her! You’re little 4-patch donation quilt is really cute! Love the focus print in it. Do you remember what line it’s from? 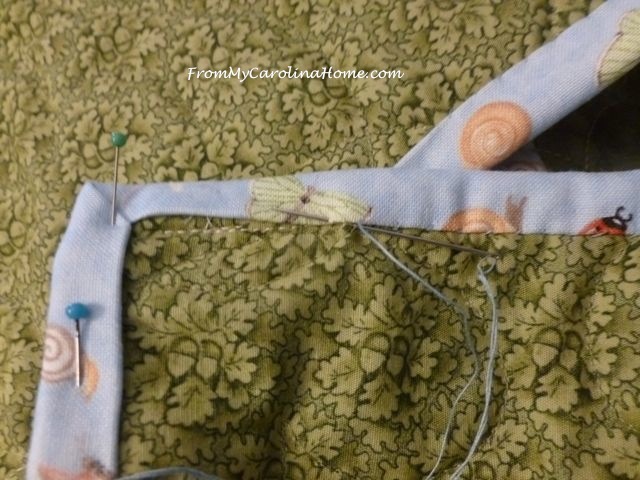 I’ve been collecting snail fabrics and would love to see if I can find this one. 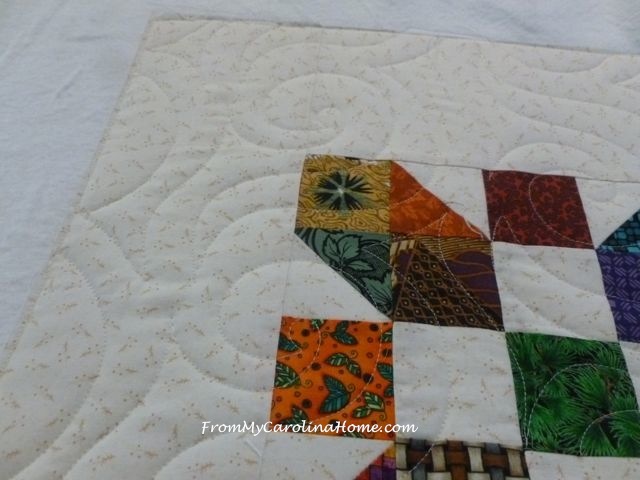 Both great finishes, your quilting designs you used really compliment the piecing. Charity quilts are looking spectacular….the recipients will love them and certainly be thankful for their hugs, comfort and warmth. Thank you for your generosity, creativity and expertise with the charity projects for our local community. Finished the backing for the baby quilt I did from Missouri Star Quilt Co. pattern, now I have to get it off to my quilter. Also I did some wonky 9 patch blocks for a baby quilt from some fat quarters I picked up at WalMart of all places, some name brands! in boy colors, turquoise and red with little doggie footprints, and baseball hats… I found out there’s a reason they have a specific sequence on those wonky 9 patches: did end up with some duplicates doggone it, but when you cut them wonky, you can’t rotate those patches easily! sigh. Got to decide if I’m going to sash them or not, there are 9 blocks that started out as 18 inch and with trimming are about 15 now, but all the same, so no problem. I have some solid turquoise, but it’s a darker shade than the more aqua (I see your Snickerdoodle Link add on the bottom of this page that is closer to the block color) so maybe not, or come up with some white. Love the Scrap Dance, and I’m a blue person, so no complaints! So after I get my esophagus procedure done on the 9th of September and check into my back problems I’ll really tackle that project.. Life can be a problem at times can’t it? Anyway you and yours have a great day. This week i finished 7/10 pillowcases. Working on 3 fidget quilts for guild. I need to quilt them up for tomorrow night! I also picked up my violin last week for lessons. I try to get 5 20-30 minute practices in per week. Two lovely quilts. 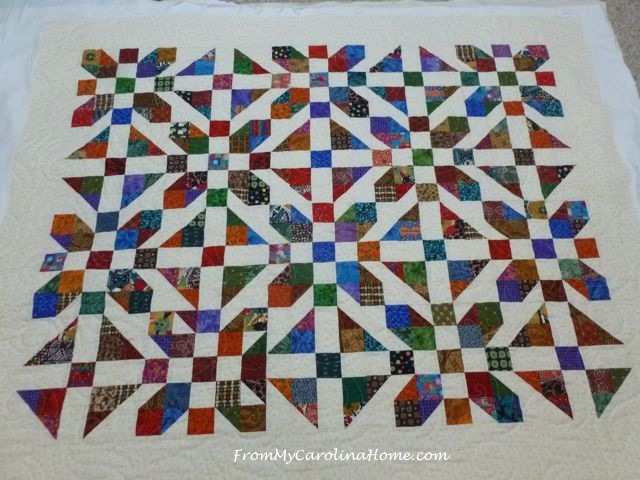 How nice to quilt one of your own designs stitched by someone else. Beautiful donations. Im starting our grandguys birthday number three quilt: DINOSAURS!! Now that I’m back from vacation I plan to do a few veterans quilts before I load the next one of my own. Those are both wonderful quilts. I do like the colors in the scrap dance – that makes it look like jewels. I do like the Scrap Dance one, and four-patches are always great. 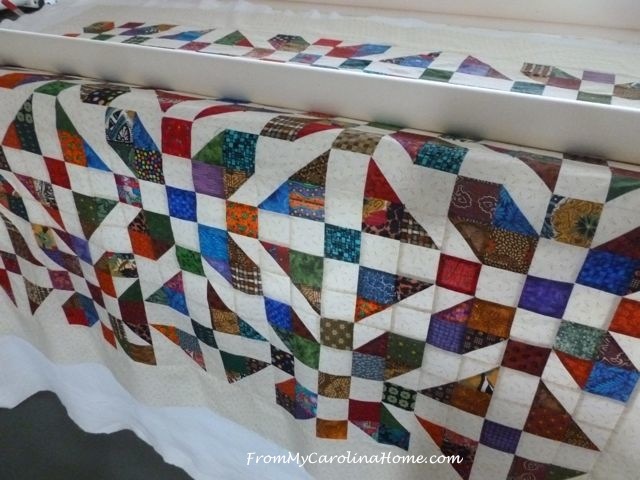 My biggest problem is building up a back-log of tops… I do sent out big quilts, although linking up with longarmers in my fairly new area has not yet been easy. I like to quilt smaller pieces on my domestic machine, but keep being distracted by new piecing projects I have to jump in to! Pretty quilts. 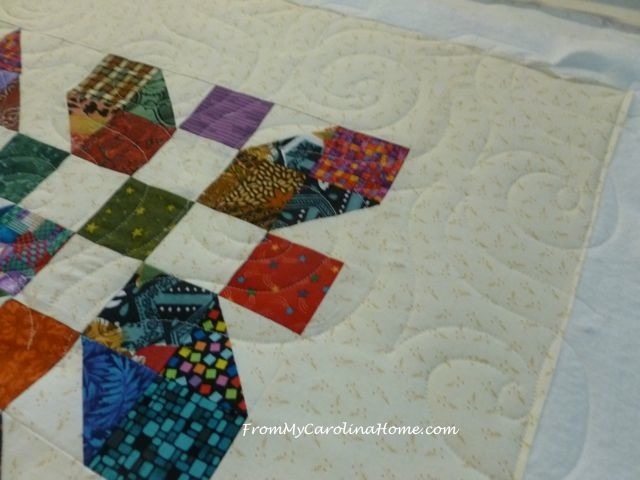 The colors really pop on the Scrap Dance (I love that pattern!). Love the swirls on the scrap dance! I think the plain border just make its! Great job on both! Your 4 patch quilt is really sweet. 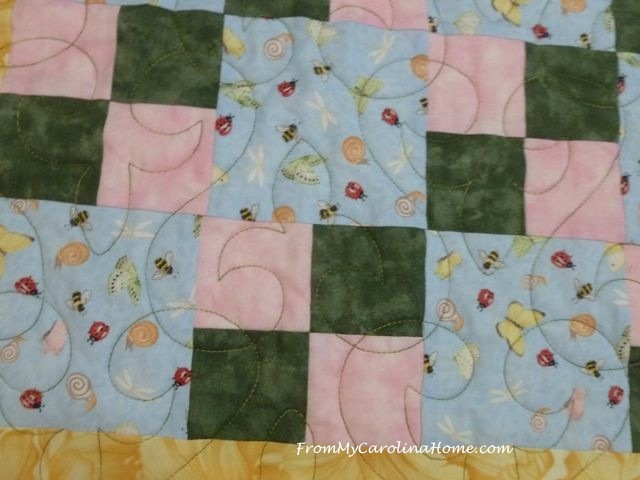 Your quilting is lovely and you are very kind to donate so much time and energy to helping others with your quilting. 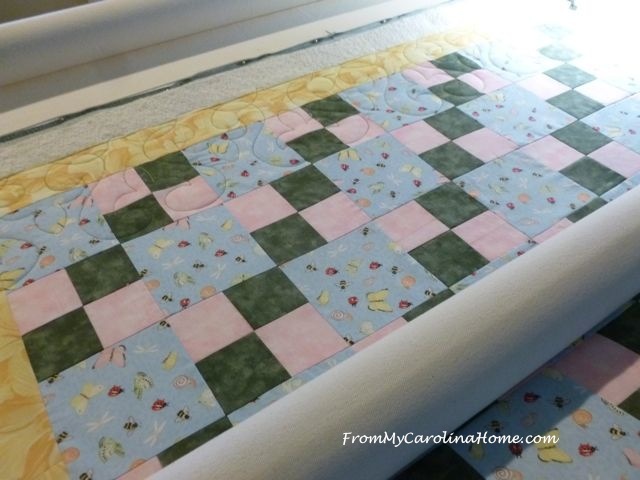 Betty’s scrap dance quilt is so pretty and the quilting you did on it looks so good. Sorry your machine was down – I’m glad that it is back up and running strong for you! Looks like time well spent! Your donation quilts are beautiful. I really like the quilt made from your pattern. The colors just pop.